I took up Karate in 1974 at a club within the KUGB. I have been an instructor since 1977. After a period of teaching for other instructors I ran my own club in West Sussex from the early 80s onwards, coaching students through to senior Dan Grade level and achieving competition success at Association and National levels including Refereeing qualifications. 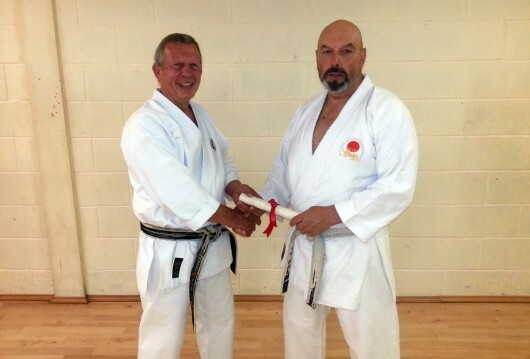 I joined the South of England Karate Union run by Sensei Mick Dewey when he formed it in 1983. It was through this that I first met and trained with Sensei Dave Hazard. I ultimately took over Brighton Shotokan Karate Club from Sensei Hazard when he relocated to the Midlands to ensure the success of his newly formed Academy of Shotokan Karate. I count myself fortunate to have been taught by the best instructors of the time and to have trained with some very talented people within Karate. I feel both proud and honoured to be from this era; my teaching career has been for me most rewarding and I feel privileged to have shown the open door of Karate to many. As the years go on my Karate evolves, as all things must, in order to continue to be successful but I will always stay true to the tradition of Shotokan Karate as defined by Sensei Enoeda and the legacy he left with Sensei Hazard. Sensei Jess Lavender was awarded the rank of 7th Dan by Sensei Hazard and the ASK’s Technical Panel.